You may find this hard to believe, but there are people still alive today who once did their mathematical calculations by sliding sticks back and forth. No keypads, no batteries, no LEDs. Just sticks. 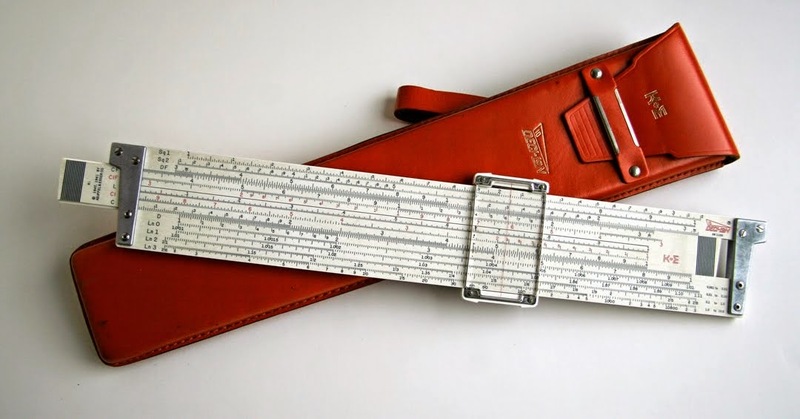 As I sat reading these words in my office I reached over to the top drawer of my desk and pulled out a familiar cloth case containing my 1975 slide rule. A thing of beauty, a logarithmic scale on two sticks. I slid the sticks and cursor and did a quick calculation to convince myself that my brain was not ready to be on display in a museum. "I've still got it," I thought, and then marveled at the rapid advancement of science, math, and communication witnessed in those 39 years. Programmable calculators were one of the next significant developments and in 1977 I had to shell out $120 for my first Texas Instruments (TI) calculator for a calculus course I was taking. It had less computing power than the GPS watch now on my wrist or the phone now in my pocket but was capable of solving formulas with the push of just a few buttons. Of course that was only after I had correctly entered all of the formula operands into the temporary memory of the TI (sometimes no small feat). The home computer revolution followed quickly after this and as the computers got more powerful their footprint got smaller. Calculations that had previously been done on devices that took up a whole room were now worked out on top of our desks. Computing took another huge leap forward when ARPANET allowed communication between computers around the world. As the World Wide Web (or Internet) grew, so did our ability to share and store information. My first forays into the "bulletin boards" of the ARPANET were to find information that research labs had stored about the chromosomal locations of common genetic disorders in humans. This information allowed me to work out experiments in which I was able to determine the probability that a patient in our clinic would develop a certain genetic disorder present in her family. I used a search program known as the Gopher protocol which was fast and efficient . . . just like my slide rule. Advancements in knowledge and search engines mean that we now have a much larger array of information available to us on a massive range of topics. Much of this began 400 years ago with the invention of the logarithm. Whether you consider it significant literature or the inspired word of God, the Bible is an important book by any standard; yet, many have never read the Bible. There are things that can get in the way of reading it. It is not the kind of work that lends itself to reading from start to finish in one sitting. In fact, it is better not to start at the beginning and read through to the end. It is better to start somewhere like the book of Mark or the book of Psalms if you are reading it for the first time. Another problem is that the language can seem old. We likely all have a Bible in our home that has been handed down in the family, and chances are that Bible will be the King James translation. That version of the Bible was first published in 1611. The tip here for new readers is to choose a contemporary translation like the New International Version, the New Living Translation, or another recent translation of the Bible. Another key to reading the Bible is reading a little at a time and reading regularly. If you have never read it before or you have tried to be consistent at reading the Bible and failed, I recommend reading one chapter a day, six days of the week. In this way you will have time to slowly consider what it is you are reading and see how it might have connection to your life. When should one read the Bible? There is no one answer to this question. Some read first thing in the morning before their day starts, others like to finish the day with reading books, newspapers, or inspirational material. Here is a general principle you might try: read the Bible before you touch your electronic devices. For me, this means before I check my phone or computer in the morning. Now you may want to adapt this and read the Bible before you touch electronic devices for social networking, since you may choose to read your Bible after you have gone to work and used any number of electronic devices. Perhaps your "rule of thumb" might be Bible before Facebook or Bible before personal email. No matter where you are at in life, from a follower of the Christian way to committed atheist, I would highly recommend giving the Bible a try. You may be surprised by the wisdom you find. According to a recent paper,1 elephants may have a greater ability to differentiate smells than any other species on the planet. The conclusion is inferred from the variety of Olfactory Receptor Genes (OFGs) in the African bush elephant genome. There are many things we might extrapolate from this research and a brief report in Science News summarizes some of them. "Everyone knows that African elephants boast versatile snouts, which can toss logs, grab food and spray water. But the towering mammals may also be the world’s best smellers, scientists report July 22 in Genome Research. The team found that African bush elephants (Loxodonta africana) carry about 2,000 genes for smell sensors, or olfactory receptors. Olfactory cells reside in the pachyderms’ nasal cavities near the tops of their trunks. Renowned sniffers like rats have around 1,200 olfactory receptor genes and dogs about 800. Humans and other primates possess relatively poor olfactory powers and just one-fifth as many olfactory genes as elephants. The researchers think that as mammal species diverged, the original smell-sensing gene duplicated in elephants. The broad smell palette perhaps explains why aromas can dictate elephant behavior. African elephants can communicate aggression via scents and can use smell to distinguish the Maasai, an ethnic Kenyan group that hunts elephants, from the Kamba, who are primarily farmers and pose no threat." Questions remain about the functionality of these olfactory receptors in the elephant and there are other contributors to olfactory sensitivity and discernment which will need to be considered. For example, researchers need to look at the amount of olfactory epithelium and the enervation of that tissue in the snout of elephants.2 Gene expression is another important factor and so experiments which differentiate between genes and their function in the elephant's nose will be important next steps in determining the importance of the OFGs. We know that in humans there are genes which code for vestigial olfactory structures which do not contribute to our sense of smell; thus, the extent to which the inferences of this article hold true await further research. 1. Niimura, Yoshihito, Atsushi Matsui, and Kazushige Touhara. "Extreme expansion of the olfactory receptor gene repertoire in African elephants and evolutionary dynamics of orthologous gene groups in 13 placental mammals." Genome Research, 2014. 2. Bear, Connors and Paradiso, Mark, Barry and Michael (2007). Neuroscience: Exploring the Brain. USA: Lippincott Williams & Wilkins. pp. 265-275. Two experiences within a few days have shaped my thinking for this blog. Earlier this week a friend made the statement that our world cannot fight the truth. Some in our world want to say that certain things are right when the fact is that they are not. He then used the metaphor that 2 + 2 will always equal 4 and that settled it for him. He was using common, everyday vernacular to reason about absolute truth. He was not seeking to be a philosopher and his argument was not meant to be a grand theme for every situation. He was appealing to a group of like-minded men to remember that things which God has spoken in the Bible are true for all time. His statement does make sense and I do not disagree with him. My second experience was reading an article in Science News, a place I regularly go to keep up to date with recent developments in the world of scientific investigation. The article suggested that quantum physics calls into question many of the basic concepts of math. One of the basic principles of math is that "If you put three pigeons in two pigeonholes, at least two of the pigeons end up in the same hole." In quantum physics, because the location of a particle is uncertain, it can appear, or perhaps it can be, that a particle is in more than one place at a given time. The author of the article goes on to explain how one can have a situation where you have more particles than boxes, but no more than one particle in each box and all particles in a box. Hmm, you can read the article to see the explanation and see if it makes sense to you. Now most people reading this article will not be able to do the complex math required to prove such a concept, so we must trust the scientists who do this work on a regular basis; but the fact is that these concepts are seeping into our majority culture. People now understand that in some circumstances 2 + 2 no longer equals 4. I write this to suggest that some of our metaphors are no longer adequate to convince others about truth. The minds of people in the majority culture have been trained to accept Schrodinger's Cat type arguments (notice how the argument has become integrated into everyday television shows, here and here). That is, people are capable of holding two opposing concepts as true at one and the same time. It is as if they are able to say two things at once: 2 + 2 equals 4, and 2 + 2 does not equal 4, and be quite comfortable with the cognitive dissonance. It is helpful to recognize that questions of right and wrong are often more complicated and less "black and white" than we would like them to be. Making broad statements which we expect others will take as absolute unless they are insane, will alienate people more than solve arguments. Listening more and speaking grand statements less is imperative to having a voice in the majority culture. Taking the time to understand why someone else thinks that 2 + 2 does not equal 4 is an essential part of loving our neighbour. At the end of the conversation we may still disagree but we will have opportunities to speak together another time. Many of us love the writings of C.S. Lewis, not because they tickle our ears with things we want to hear; but precisely because they challenge us with a new way of hearing the old message of the Gospel of Jesus. When we think we have our theology and practice all worked out, it is good to be challenged by the insights of others. In The Last Battle, book seven of Lewis' Chronicles of Narnia, there is a scene in which a soldier, a devoted follower of the god Tash, interacts with Aslan the Lion, the true Lord of Narnia and of the world. Emeth, who was raised to serve Tash, is extremely loyal, ethical, and spiritual. His faith in Tash is strong and he lives with whole-hearted devotion to the only god he knows. Near the end of the book, Emeth is confronted with the evil and impotence of Tash as this false god falls before Aslan. Emeth realizes his error in serving Tash all of his life and prepares to be judged by the true Lord, Aslan. He believes it to be his "hour of death" "for the Lion (who is worthy of all honour) will know that [he has] served Tash" all his days and not Aslan. Still, he considers it "better to see the Lion and die" than not see him at all. Aslan surprises Emeth by calling him a son and welcoming him into Aslan's presence. Emeth and Aslan exchange the following words. "Alas Lord, I am no son of thine but the servant of Tash. He answered, Child, all service thou hast done to Tash, I account as service done to me." Emeth asks if it is true that Tash and Aslan are one and the same Lord. In the following quote Emeth relates the Aslan's response. The Lion growled so that the earth shook (but his wrath was not against me) and said, It is false. Not because he and I are one, but because we are opposites, I take to me the services which thou hast done to him. For I and he are of such different kinds that no service which is vile can be done to me, and none which is not vile can be done to him. Let that last line settle in for a moment. There are several clues here that Lewis is not espousing universalism. He was not prone to such errors. He is, however, speaking of a form of inclusivism that does make me somewhat uncomfortable. This discomfort is just the kind of challenge I said I needed; and yet it is disconcerting just the same. The fact is, I am more like Emeth than I would like to believe. I serve Jesus with a degree of devotion and loyalty that is imperfect and I understand this God whom I serve less than completely. Even though I sometimes convince myself that I understand him pretty well, I serve an image of Jesus that is woefully incomplete (every time I read about him in the Bible I realize another way in which I have missed an aspect of his nature). This false image of who Jesus is sometimes approaches idolatry. Despite my imperfection, despite my inability to understand even a basic principle like the trinity, I choose to follow God. Out of gratitude for this Lord who understands me perfectly and who has sacrificed himself for my sin and imperfection, I give my life. To quote an old hymn, I say to Jesus, "Take my life and let it be consecrated Lord to Thee; Take my moments and my days . . . Take my hands . . . Take my feet . . . Take my voice . . . Take my lips . . . Take my silver and my gold . . . Take my intellect . . . Take my will . . . Take my heart . . . Take my love . . . Take myself . . . ."
A recent article published in the journal Science found that "participants typically did not enjoy spending 6 to 15 minutes in a room by themselves with nothing to do but think. "1 Humans are capable of day-dreaming, fantasizing, meditating, and praying but when given time and space to do so, researchers found that most of the participants found it to be unsettling and rated their enjoyment of the time as low. Participants were put into an unadorned room with nothing on which to focus for 6, 12, or 15 minutes. At the end of the time they were asked questions about the experience. "On average, participants did not enjoy the experience very much: 49.3% reported enjoyment that was at or below the midpoint of the scale. "2 When the researchers did further experiments with other participants and gave them the option of "entertaining themselves with their own thoughts" or engaging in activities such as reading or listening to music many chose to do something rather than just think. The participants also enjoyed the activities more than they enjoyed time spent thinking. The researchers took things one step further and gave people the choice of sitting quietly thinking or giving themselves an electric shock. The participants had previously experienced the shock and knew it to be unpleasant. "Many participants elected to receive negative stimulation over no stimulation - especially men: 67% of men (12 of 18) gave themselves at least one shock during the thinking period . . . compared to 25% of women. "3 The researchers found it striking that many participants found being alone with their own thoughts for 15 minutes so unpleasant that they would rather self-administer a shock that they had previously indicated they wanted to avoid. Can make a Heav'n of Hell, a Hell of Heav'n." I hope that we might all find more heaven than hell in those moments of quiet solitude. Webb, Jonathan. "Do People Choose Pain Over Boredom?" BBC News Science and Environment. July 4, 2014. http://www.bbc.com/news/science-environment-28130690 (accessed July 7, 2014). Wilson, Timothy D. "Just think: The challenges of the disengaged mind." Science 345, no. 6192 (July 2014): 75-77. Fans of the music will have their favourites; and for me, one of the best will always be "Lady Run, Lady Hide." Whether or not it was intentional, it sounds like an environmental ode to our planet. You can listen to it here; but, really listen to it by listening several times focusing on a different instrument, voice, or section each time. Yes, it is over-produced by the standards of music today; but what an overproduction! In the fall of 2008, journalist and author, Joshua Wolf Shenk was given the rare privilege to spend a month reading the results of a 70 year longitudinal study of mental and physical well-being known as the "Grant Study." Prior to this, the files had been kept locked up to all but a few researchers. The subjects of this study were 268 male students at Harvard. They had been sophomores in 1937 when the study began, so in 2009, those that were still alive, were in their late 80s. The chief curator for the study, the psychiatrist George Vaillant, kept the work going through the years by raising funds, creating the surveys to which the men responded, and publishing books on the findings. Shenk's article, "What Makes Us Happy?," was published in The Atlantic on June 1, 2009 and can be seen in its online version here. Shenk admits that it is difficult to separate the interpretation of results from the persona of George Vaillant whose own psychological and physical development occurred while he watched 268 lives unfold. Vaillant asserts that “Alcoholism is a disorder of great destructive power”4 and abuse of alcohol was the most likely predictor of unhappiness. We didn't need a longitudinal study of Harvard men to tell us this; everyone has one or two friends or relatives pointing toward this truth. Happiness is notoriously hard to quantify, and "a good life" is a subjective term. We should not be surprised that even George Vaillant cannot be the source for a Facebook status or inspirational poster that will forever state the secret of the good life. But, is that a fair summary? Even if we could determine action points from these words, would this explain the majority of scenarios? A few of the stories from the Grant Study would suggest more complex systems. In our social media age, we often look for binary conclusions; or at least a clever line that we can use as a status update on Facebook. Perhaps we should be looking at the stories of people's lives rather than snippets of data. Perhaps we need a biographical approach. What story does each life tell? What story will each of our lives tell? To whom will our story point? Will it be an example of one who lived a "happy life," or a story of sacrifice and love for others? Gregoire, Carolyn. "The 75 Year Study That Found The Secrets To A Fulfilling Life." The Huffington Post. August 11, 2013. http://www.huffingtonpost.com/2013/08/11/how-this-harvard-psycholo_n_3727229.html (accessed July 4, 2014). Shenk, Joshua Wolf. "What Makes Us Happy?" The Atlantic. June 1, 2009. http://www.theatlantic.com/magazine/archive/2009/06/what-makes-us-happy/307439/ (accessed July 4, 2014). Stossell, Scott. "What Makes Us Happy Revisited: A new look at the famous Harvard study of what makes people thrive." The Atlantic. April 24, 2013. http://www.theatlantic.com/magazine/archive/2013/05/thanks-mom/309287/ (accessed July 4, 2014).